Lagos State Gov. Akinwunmi Ambode unveiling the first set of new Lake RIce with Kebbi State Gov. After more than five months of total scarcity even in warehouse across the state, the Lagos State Government has announced that its indigenous rice called “Lake Rice” would be available in markets before the year ends at the rate of N12,000 per bag. Business Hilights checks in the last few months across all selling depots in Ministry of Agriculture and Extension Services Centres showed that no single bag of Lake has arrived from Kebbi State since the very last supply in July. In one of the Extension Offices (name with held), one of the government staff confided in our correspondent that “We have noticed that since this year, whenever we get truck loads of consignments and we are ready to sale, within few days, another set of empty trucks will come with approvals from the ‘above’ to evacuate all available rice to where we cannot explain and we cannot ask any further question only to tell incoming buyers that rice has finished”. “There are lots of official racketeering in the sale of Lake Rice in government office. The only problem is that we cannot talk all we see here to the public. “All of us here are now in enemies to many lovers of the product because they accuse us of hiding truck loads of rice which is not our faults. However, it is not clear if the highly expected truck loads of Lake Rice will face similar disappearance challenge of being swept away few days after arrival at selling depots as the Special Adviser to Gov. 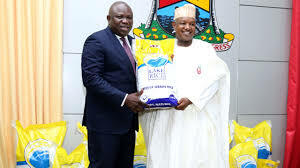 Akinwumi Ambode on Food Security, Mr Okanlawon Sanni, agreed that though the commodity was not available in the markets now, efforts were being made to ensure its availability to buyers during the Yuletide. According to him, “The Lake Rice is not in the market for now but any moment from now, it will arrive from Kebbi and Lagosians will have enough of it during the festive period for N12, 000. “The rice will be available at all local government areas across Lagos and in designated centres, retail markets and super stores,” he said. “The state government had taken stocks of the equipment for the up calling of the Imota rice mill and that the installation will commence soon.